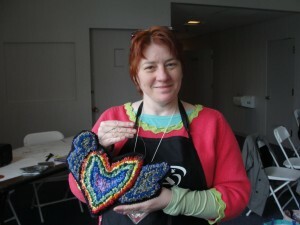 The rug hooking teacher posted some great pictures and her reflections on Artfest 2011. She included this great picture of me with my finished heart with wings. I loved this project and looking forward to trying something simular with my students. This entry was posted in Fiber Goodness on April 19, 2011 by Sheba.